The Hive played some great football but they were ultimately undone by a combination of outstanding goalkeeping from the Dyce keeper and some disappointing refereeing decisions. 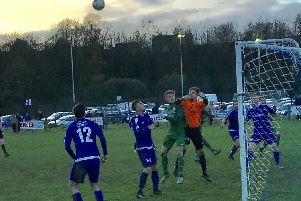 Two penalties that confused and enraged the home crowd in equal measure were enough to ensure a resurgent Dyce progressed to the next round. The Hive took the lead on 10 minutes when Stephen Robertson’s pass to Calum Watson was finished off with a chip over keeper Craig Reid, who had already thwarted Watson with an excellent save. However eight minutes later the teams were level when Dyce were awarded a very debatable penalty. Striker Paul Esslemont broke through but Hive keeper Reece Duncan appeared to have got the ball, only to be stunned along with almost everyone else in the ground when a spot kick was awarded. Esslemont duly levelled the score. The Hive hit back, though, when Calum Watson headed in Rob Armstrong’s corner kick on 41 minutes, to lead 2-1 at the interval. Dyce squared the game again after 68 minutes, Mark Bartlet netting after a good move. Seven minutes later Dyce were awarded another, very soft penalty following a nudge by Clark Robertson on Steve Bartlet. With Esslemont off, Ian Leith made it 3-2 to the visitors. Calum Watson went close to taking the game into extra time with two more good efforts, with one blocked on the line and the other saved by Reid. “It’s always hard to swallow a defeat when the big decisions go against you,” Hive boss Martyn Rollo told the Mearns Leader this week. Dyce co-manager Alfie Youngson admitted: “A draw would probably have been a fairer result. Man of the match for Stonehaven was Lewis Johnston. A massive thank you goes to McKenzie Franklin of Stonehaven Girls Under-13s for being the match day mascot. Stonehaven: Duncan, Fenby, Metelski, Johnston (Peters 86), C Robertson, Thomson, Armstrong, S Robertson (Kidd 78), Watson, Mackie (Shand 67), Morrice. Stonehaven are away to Ellon United in the Superleague this Saturday (2pm), weather permitting.